DownloadStudio - Internet Download Manager And Download Accelerator - Download files, pictures, audio, video, web sites and FTP sites fast! DownloadStudio. Get everything on the web. DownloadStudio is the award-winning, high performance download manager that lets you get everything on the web! It lets you download programs, games, flash video, music, movies, TV shows, photos, streaming audio, streaming video, documents, RSS feeds, blogs, podcasts, complete web sites, complete FTP sites and much more! Download video, music and all types of files from popular sites on the web! DownloadStudio has more downloading tools than any other download manager! DownloadStudio is the only download manager that includes over 12 specialized downloading tools that will let you get any file from the internet that you want. All tools are easy-to-use, integrated into DownloadStudio and have comprehensive online help and tutorials. Are you downloading files as fast as possible? DownloadStudio has advanced downloading techniques that make it the fastest download manager on the planet! DownloadStudio has just been tested against all popular download managers and web browsers. 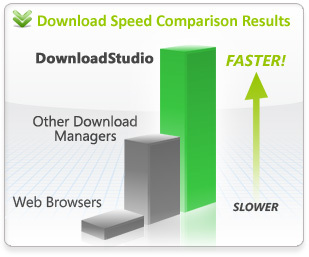 After downloading more than 10,000 files from more than 300 web sites located all around the world, DownloadStudio was consistently the fastest download manager - in many cases over 50% faster than other download managers and over 5 times faster than web browsers! So, why waste time waiting for your web browser or other download managers? Try DownloadStudio today! Unlike other download managers, DownloadStudio does not contain any ads, malware, spyware or add-ons from other companies. You just get 12 downloading tools that will help you download all the files you want as fast as possible. Developers: Do you need download technology for your software product? The Conceiva Download SDK provides you with all the power and features you need for ultra-fast downloading. The SDK incorporates the same proven technology used in DownloadStudio and has been developed by Conceiva for over 5 years. Features include accelerated downloading, resume broken downloads and supports for all popular internet protocols, including HTTP, HTTPS, FTP, MMS, RSS, RDF and ATOM. The SDK contains a complete set of APIs, DLLs, header files, documentation and sample programs to get your software product downloading quickly. Save tons of development time, and get the benefits of ultra-fast, stable, resumable downloading technology into your products today. Need help to create your app? Our software development team can build your software application for you. We have created many software applications for companies all around the world that are used by millions of users daily! The Conceiva Download SDK is perfect for downloading software updates, software components, video files, compressed files, large files, small files or any type of file from web servers. Contact us today at sales@conceiva.com to discuss evaluating and licensing the Conceiva Download SDK for your products.